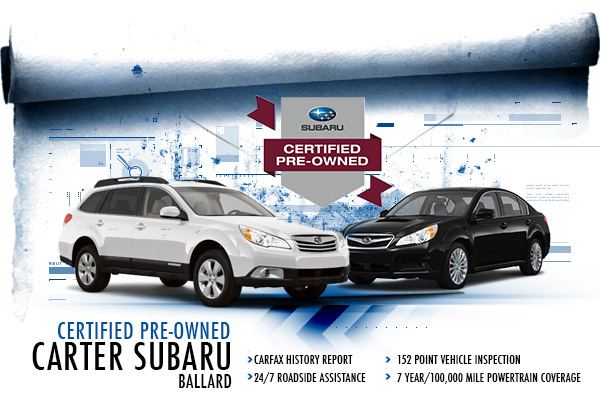 Why Purchase Certified Pre-Owned from Carter Subaru Ballard? When you choose to buy a Certified Pre-Owned Subaru from Carter Subaru Ballard you'll be getting a number of great benefits. Our Certified Pre-Owned Vehicles are held to the highest of standards. Each vehicle receives a rigorous 152-point Vehicle Safety Inspection and if during the inspection we find something that does not meet our high standards it is repaired or replaced. A CARFAX® Vehicle History report is also included with every Certified Pre-Owned vehicle, giving you the history of your vehicle, from past service records, to the number of previous owners. Purchasing a Certified Pre-Owned Subaru from Carter Subaru Ballard gives you peace of mind that your vehicle will be taken care of should a problem arise. 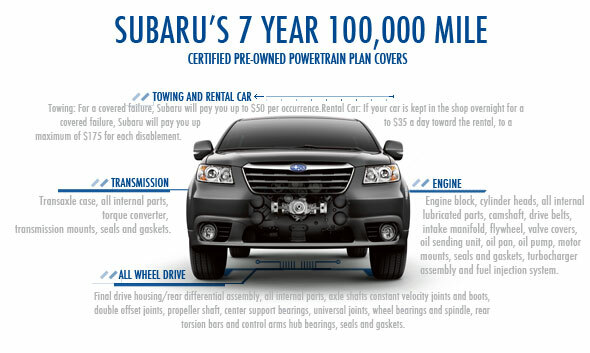 Each Certified Pre-Owned vehicle comes with a Subaru-backed 7 year/100,000 Mile Powertrain Coverage Plan. This plan covers problems with the Engine, Transmission, and All-Wheel Drive. And should a breakdown occur, each vehicle comes with 24/7 roadside assistance. The parts of the engine covered under the Powertrain plan include: the engine block, the camshaft, cylinder heads, valve covers, drive belts, flywheel, intake manifolds the motor mounts, oil pump and pan, the oil sending unit, all internal lubricated parts, all the seals and gaskets, the turbocharger assembly and the fuel injection system. All the internal parts of the transmission, transmission mounts, the transaxle case, the torque converter and all the seals and gaskets are covered. The All-Wheel Drive parts that are covered are: the final drive housing/rear differential assembly, all internal parts, axle shafts, propeller shaft, hub bearings, double offset joints, universal joints, center support bearings, wheel bearings and spindle, constant velocity joints and boots, rear torsion bars and control arms, and the seals and gasket. Should you break down and the failure is covered under the plan, Subaru will pay up to $50 per occurrence for towing. If your car needs to be kept overnight for the failure, Subaru will pay up to $35 a day for the rental, up to a maximum of $175 for each disablement. Carter Subaru Ballard also offers two more comprehensive plans that upgrade your coverage. Both the Added Security extended service plans are backed by Subaru of America and Carter Subaru Ballard in Seattle is proud to offer them to our customers. Visit our dealership at 5201 Leary Ave NW to learn more about these two great coverage plans for your Certified Pre-Owned Subaru. The Subaru Classic Plan covers everything included in the Powertrain Plan with the additional benefits of the Cooling and Fuel system, Steering, Front Suspension, Air Conditioning, Electrical, and Brakes also being covered. The Subaru Gold Plus Plan offers you the most bumper-to-bumper coverage. There are just a few body parts and maintenance services not covered. The Gold Plus Plan also includes trip allowance. If a breakdown occurs while traveling out of town and the repair is covered, Subaru will pay up to $500 towards lodging and meals for you and your family. The plan also includes 24-hour emergency on-site road service for jump start, a tire change with your good spare, delivery of gasoline, and other minor repairs, as well as Road Hazard Tire Protection. The great benefits of an Added Security Plan go beyond giving you peace of mind that your car will be taken care of if a problem arises. They increase the value of your vehicle. If you sell your Subaru to a private owner any remaining coverage from an Added Security Plan can be transferred to them, or you can also choose to cancel your coverage and apply for a pro rate refund. When you choose a Subaru plan with a deductible you will only pay it once per repair visit. Some other plans with deductibles will charge for each different component that is repaired during each visit. Carter Subaru Ballard is happy to honor all Added Security Plans and our Factory Trained Technicians will perform any necessary repairs. 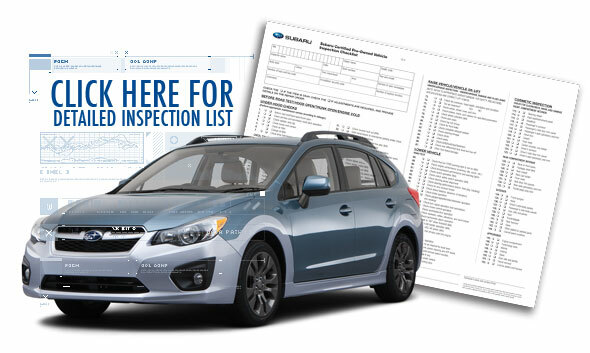 You can also find nearly 600 authorized Subaru dealers across the United States and Canada, all with Factory Trained Technicians that use Genuine Subaru Parts. In an emergency you can call Subaru toll-free and find an authorized repair facility. If you lease your Subaru the cost of the Maintenance Plan can be included in your lease payment. And roadside assistance is included for no additional cost. When you choose a Maintenance Plan you can lock-in the cost of your scheduled maintenance that is required to keep your factory warranty in place, and it ensures that your car remains in tip- top running condition. All services are performed by Factory Trained Technicians with Genuine Subaru Parts. There are a total of eight different plans of coverage to choose from so finding the plan that's right for you is easy. To find out more about Certified Pre-Owned Vehicles and all the great Added Security Plans offered at Carter Subaru Ballard visit our Seattle dealership today at 5201 Leary Ave. NW, or give our Sales Department a call at (888) 843-2701.